Double bills often work best when some thought has gone into the pairing. Zemlinsky’s Der Zwerg (The Dwarf) is often twinned with the composer’s other Oscar Wilde opera, A Florentine Tragedy, and last years production in Lübeck (see here) made a good case for linking the two completely different stories. 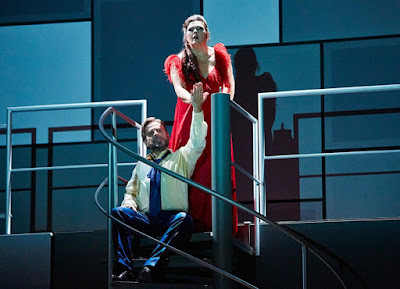 Bartok’s Bluebeard’s Castle makes an interesting coupling for Der Zwerg. There are parallels between the two composers, born a decade apart and both finding refuge from the Third Reich in the USA but dying within a few of years of emigrating. Both operas are based on what might broadly be termed ‘fairy tales’, though definitely from the darker end of the spectrum. Both also involve themes about revelation and self-revelation: Bluebeard’s innermost secrets are progressively revealed through the seven doors of his castle; the dwarf finally discovers the truth about his ugly appearance and dies from the pain. And both Bluebeard and the dwarf seek love but are betrayed by, respectively, self-deception and thoughtless leading-on. Urs Häberli has made no attempt to link the two operas in his staging, and they inhabit visual worlds as different as their musical ones. Bluebeard’s castle is a split-level wall in shades of blue-grey, in which six of the seven doors are incorporated into the Mondriaan-like squares and rectangles (the other, for the lake of tears, is in the mezzanine floor). In fact I think this must be the first production I’ve seen which actually has physical doors, as opposed to other analogies for the openings on Bluebeard’s mind and realms, though the ‘contents’ are left to the imagination with changing colours of lighting. The interaction of the two characters is naturalistic and well directed, and there is a parallel in the baring of Bluebeard’s soul in the way he gradually removes garments – coat, gloves, jacket, waistcoat – as his secrets are uncovered; the fate of Judith, on the other hand, is to end up veiled and covered up along with the former wives. There was a sense that Adelheid Fink’s Judith was going through the motions for this last performance in a three-month run, and her slightly squally singing (the opera was given in the standard German translation by Wilhelm Ziegler) and unengaged acting detracted from the overall performance. 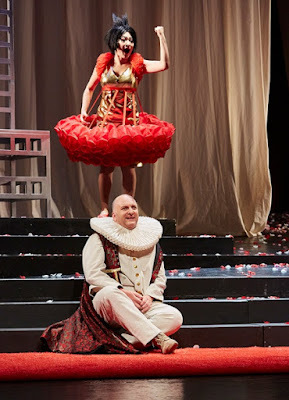 Guido Jentjens’s Bluebeard, though, was richly sung and his fine acting projected much of the character’s pain and disappointment. The Dwarf was a visual treat, with Ursula Beutler’s costumes giving a whimsical and contemporary twist to Renaissance Spanish court wear, with its extravagant wigs and ruffs. The brightness and lightness of touch of the direction only highlighted the ultimate tragedy, where the dwarf the Infanta, Donna Clara, has been given for her birthday is ultimately forgotten as another broken toy just at the moment his own self-revelation kills him. Heiko Börner, who had sung Peter Grimes in Krefeld only four days earlier (reviewed here), gave a gripping performance of the title role – touching, searing and lyrical in equal measure (and a better fit to his tenor than Grimes had been). 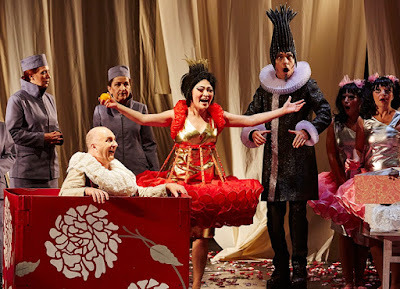 Jihyun Cecilia Lee caught the Infanta’s childishness that drives the drama with singing that was bell-like in its clarity yet never sounded precious. The rest of the cast was just as convincing. 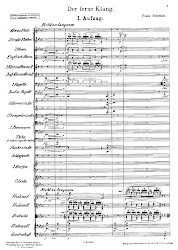 But most impressive of all was the playing of the Pfalztheater’s orchestra under Uwe Sandner – quite simply the most texturally detailed, beautifully shaped and masterly performance of Zemlinsky’s irridescent score I’ve heard in the theatre.